How to convert 13.4V AC power to 12V DC power? Can anyone give me some tutorial on how to convert AC power to DC Power? Basically I have a transformer step down the AC voltage from 230V to 13.4V on 50Hz. In order for me to be able connect LED light directly to the wall, first of all I need to convert the AC Power to DC Power. To be honest I am a noob when come to electronic part especially the calculation section so please go easy on me. What I have done so far is getting a rectifier and transistor. I tested the rectifier at first, it convert AC to DC power successfully but somehow my voltage drop by 1.7 Volt. I end up getting 11.7V. I notice that the voltage goes up and down from 11.73V - 11.79V. Then I add a transistor with 16V and 100UF to smooth the wave. When I checked my voltage goes up to 18.32V - 18.37V. Due to lack of knowledge, apparently I got myself a wrong transistor. After googling for a while I found the formula but cant figure out how to use them. After asking around apparently I need more than just rectifier and transistor to keep the LED last longer plus the AC Power with 50hz will make the LED flickering. I need help in building a complete 13.4V AC power to 12V converter plus a power constant current source. By "transistor," do you mean "capacitor?" A cap is what you need here, and the specs (16V and 100uF) do indeed describe a capacitor. AC voltages are usually measured as RMS, which is a metric of the average voltage, as AC is a sine wave. Since AC V drops and passes 0V in it's cycle, the peak voltage--the highest voltage--is greater, approx 1.4 times RMS. Stepdown tranformers convert AC voltage to a lower AC V, probably 220VAC to 13.4VAC in your case (I'm guessing 220V 'cause you mention 50 Hz). The peak voltage of 13.4VAC then is approx 13.4 X 1.4, or 18.76VAC. That's pretty close to your measurements. Rectifier diodes will drop the voltage another 0.6 or 0.7V. Even after rectification, the voltage is still a "wave"--you need the capacitor to smooth out the rectified output. A filter capacitor stores current, and does so up to the peak voltage. Appropriately filtered with capacitors, a DC power supply will have a voltage nearly that of the peak--which explains why your output is higher than 13.4V. The 16V capacitor is insufficent for 18+V, and will probably fail at some point. If you need 12V, a voltage regulator is also required--especially if it's a constant-current source you require. Hi gmoon, thank you for replying. Yes you were right it is a capacitor instead of transistor and yes you were again it is 220V. Correct me if I'm wrong, someone told me because I picked a wrong farads of the capacitor cause increase in voltage to 18V. By the way, do you think you can draw me a rough diagram so I can give them a try. I will keep you updated on the experiment. Maybe we can post them on this site if the experiment goes well. Thank you again for the tutorial. The capacitance value itself isn't a problem. 220uF (microfarads) is perfectly appropriate. Having more or less capacitance in your "filter cap" will only effect how effectively "smooth" the DC voltage becomes. 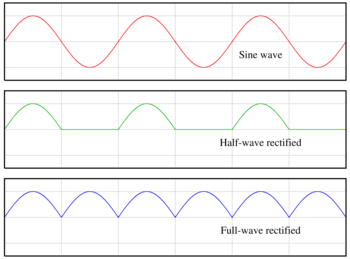 More capacitance lessens the "ripple" of the power supply, less capacitance allows more of the original pulse through. There's no "wrong" choice here--just more or less effectiveness as a filter (no cap at all is just pulsed DC--full-wave rectified AC). You cannot raise the DC output above peak voltage of the output transformer. Base on the voltage problematic you recommend that I should get a capacitor which capable of carrying higher voltage capacity such as 25V. Regarding the capacitance value the bigger micro farads the better it handle smoothing current. Does the diagram mean it doesn't matter what is the input voltage as long as it didn't exceed 35V then the output value get adjusted by resistor? Is LM317 the name of regulator? Yes, it regulates the CURRENT to whatever, provided the voltage doesn't exceed 35 volts on the input. LM317 is indeed the name of the part. ...why I was pointing the OP to a regulator--most voltage reg datasheets include a current reg circuit.